Paris, that dreamy setting of groundbreaking creative communities and mediocre romantic comedies, is brimming with artistic attractions. From its amazing museums, to the almost painfully gorgeous Haussmannian architecture, it's the sort of city where rain on the sidewalk looks positively Monet-esque. You've likely already seen (or heard about) the big guns: You've trekked to Rodin, queued at Musée d'Orsay, and contemplated the legacy of I.M.Pei's Pyramid at the Louvre. Still aching for more? We've tracked down one of the city's art insiders to discover where to go to check out under-the-radar and up-and-coming artists. The Art Scene: "Belleville is one of my favorite districts in town," says local doyenne Domoina de Brantes, a former street art gallerist. In her present post as Art Concierge at the Philippe Starck-designed Le Royal Monceau - Raffles Paris, de Brantes specializes in demystifying emerging neighborhoods like northeastern Belleville, the once-forlorn cross-section of the 11th, 19th, and 20th arrondissements (districts). Some of the city's hottest contemporary artists have set up shop here, seeking bigger spaces and better rents. De Brantes recommends La Forge de Belleville, an artists' collective in a renovated 1912-era factory. Local favorites Teurk, Jean Faucheur, and Babou keep studios here, all of which are accessible without appointment. "And travelers should definitely visit Bugada & Cargnel," de Brantes added. This 5,300-square-foot former parking garage is run by artist Suzanne Tarasieve, and hosts exhibitions by the likes of Julio le Parc and Art Cologne. After the Art: Once you're done pondering the pieces, do like the locals do and grab an aperitif or deux at Aux Folie's Café, a popular joint crowded with students, aspiring artists, and gallery-goers. Walk it off at Parc de Belleville, which de Brantes describes as having "the most amazing views of Paris – and almost no tourists." 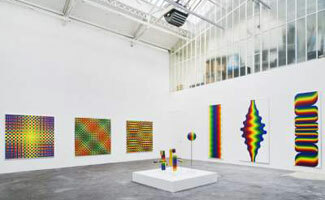 The Art Scene: On the other side of the city, Saint Germain des Pres and Montparnasse are home to established players, like the Jean Nouvel-designed Fondation Cartier pour l'Art Contemporain, as well as hidden gems like de Brantes' cherished La Maison Revue Noire. This welcoming Montparnasse spot specializes in art from the African diaspora. Expect to bump into the artists on exhibition, like Haitian painter Mario Benjamin and Madagascar's renowned installation architect, Joel Andrianomearisoa. After the Art: Nearby bar a vins Le Garde Robe serves cheese and charcuterie accompanied by an exceptional wine list specializing in organic and biodynamic bottles. The Bottom Line: De Brantes has tackled such exclusive feats as bringing a major collection to Raffles for a private viewing, and arranging an after-hours tour of Centre Pompidou. But, for those feeling richer in spirit than in pocket, she points out that insider's access can be surprisingly affordable once you know where to look. None of her favorite galleries in Belleville, Saint Germain, or Montparnasse charge an entrance fee. Plus, she notes that all of the city's public museums are free on the first Sunday of every month. It's no wonder de Brantes sings the city's praises – with an accessible contemporary scene like this, Paris is for [art] lovers.